Think sticks are good, free toys for dogs? Read this. Do you throw sticks for your dog to fetch? Do you let your dog chew sticks? Lots of people do, and lots of dogs love to fetch and chew sticks, right? You see it all the time at the park, on the beach, and in yards. I personally get nervous though when I see dogs chewing and chasing sticks, and I know that many of my veterinarian colleagues and our technical support staff do, too. Do you know why? 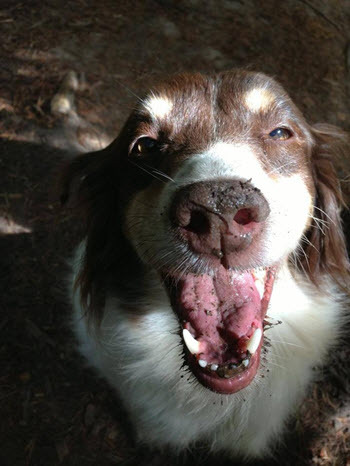 It’s because we see the results of dogs chewing and chasing sticks! Every year many dogs suffer significant pain and injuries from sticks, and that some dogs even die from their stick-related injuries. It’s true – and it happens far more frequently than you might expect. Want some proof? See the many stories at the end of this article. Fortunately though, with awareness and some simple preventive steps, you can protect your dog from such a fate. Of course, not every stick-related injury is preventable, so it’s also important that you be aware of the steps you should take in the event that your dog does suffer from one. Read on to learn what you need to know to best protect your dogs from the many dangers of sticks. Dogs love sticks, but sticks don’t always love dogs! Both chewing and chasing sticks can cause severe and potentially fatal problems. 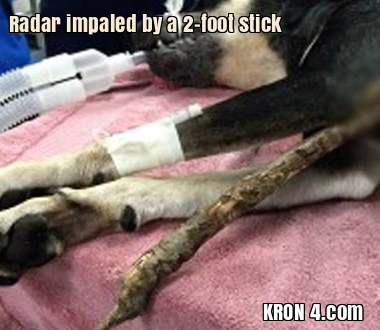 If your dog impales himself on a stick, immediate veterinary attention is critical. How do sticks injure dogs? Dogs typically sustain stick-related injuries in one of two ways – through chasing or chewing. And while stick-chasing injuries are typically more severe than the stick-chewing injuries, that’s not always the case. Sticks, abundant and free though they may be, truly can pose significant and life-threatening injuries to your dog. Stick chewers are at risk of a multitude of problems, ranging from wood splinters stuck under their gums and other tissues in the mouth to obstruction of their digestive and/or respiratory tract with wood. Large wood fragments embedded between the upper teeth and along the surface of the hard palate, or even embedded directly into the hard palate. This can result in severe enough damage to the teeth or palate to require surgery. Large wood fragments being swallowed, resulting in digestive tract irritation, bleeding, and possible obstruction. Large or small pieces of wood being aspirated (inhaled) into the trachea, leading to possible obstruction, irritation, and/or infection of the respiratory tract. Such wood fragments can also lead to puncture of the trachea or lung tissue, resulting in a chest infection or even damage to the heart, nerves, and/or blood vessels. As mentioned above, the dogs who chase sticks frequently suffer more severe (read: more painful, expensive, and likely-to-be-fatal) injuries than the stick chewers. And given the potential severity of the injuries commonly associated with stick chewing listed above, you’re hopefully starting to appreciate the potential severity and heartbreak that can occur when dogs chase sticks. These injuries typically happen when a thrown stick gets, well… stuck in the ground and the eager dog either pounces or runs onto the exposed sharp end of it. These sticks then cause significant puncture wounds and other damage. Eye: Resulting in direct damage to their eye, including the blood vessels and nerves associated with the eye. If the force of the penetration is great enough, the stick can result in damage to your dog’s brain, too. Mouth: Stick penetration in the mouth can wreak havoc with a lot of important structures, including the tongue, laryngeal and pharyngeal tissues, palate (“roof”) of the mouth, teeth, esophagus, and trachea. These types of traumas can also cause damage to the nerves and/or blood vessels within your dog’s neck, and, depending on the direction the stick takes, there can also be significant damage to your dog’s sinuses and/or brain. Chest: As you might imagine, with all of the important structures that are present within the chest cavity, the damage that a stick penetration in this area can be severe. Along with the heart and lungs, the chest also houses many large blood vessels and important nerves, as well as the diaphragm, trachea, and esophagus. If the penetrating stick enters their chest in the area of their armpit axilla), then you can also have damage to their brachial plexus – an important grouping of nerves and blood vessels. Abdomen: Stick penetration in this area can easily result in damage to multiple important organs. Commonly affected organs include the stomach, liver, spleen, and intestines. Additional damage to the urinary bladder, gall bladder, and/or diaphragm often further complicates the surgery that is necessary to save the life of these dogs. To make matters worse, the initial damage caused by the penetration of the stick isn’t always indicative of the full extent of a dog’s injuries, either. Despite best efforts, it’s often possible for small fragments or splinters of wood to be missed during initial surgical exploration of such puncture wounds. This is not due to a lack of care or skill by the attending veterinary team, but rather due to the nature of penetrating stick foreign bodies to shatter and splinter upon impact. This potential problem is compounded by the fact that wood itself doesn’t necessarily show up on X-rays, especially small splinters of wood. So recognize that there is always the possibility of the need for further surgeries once the situation has become clearer and any residual wood pieces have “declared” themselves. Being armed with the information above, hopefully you’ll never need the information below. But, just in case, it’s important that you know what to do should your dog ever suffer a stick-impalement. Be aware that the steps you should take can vary slightly with the area of penetration, the number of helpers you have, and your distance from the nearest Animal ER. However, there are some steps that are important regardless of these influencing factors. Get your dog in for veterinary evaluation and treatment as quickly as you can. Delay doesn’t just prolong pain, suffering, and distress, it’s likely to increase your dog’s risk of death, too. If possible, call the hospital while en route to advise them of your impending arrival – doing so can allow the medical team to be better prepared to more quickly care for your dog when you get there. Avoid the urge to remove the stick. It’s typically better to leave the penetrating stick in place, so that it can be removed and its path evaluated once at the vet. Sometimes the mere presence of the stick is the only thing preventing a massive loss of blood and/or a collapsed lung, too. Your default action should be to leave the stick in place, if possible and safe to do so. Prevent the protruding end of the stick from getting caught on anything during transport to the vet. Try not to snap or saw the stick, as the jarring motion that can result from doing so can dislodge the stick or even cause further damage. If you can safely cut the protruding end of the stick, without causing too much vibration or movement, and if doing so won’t unnecessarily delay your arrival at the vet hospital, this can be attempted. Wrap the protruding end of the stick with a t-shirt, towel, bandage material, or some other bulky material. This won’t only prevent the sharp end of the stick from injuring you, or whoever else is carrying your dog, but it can also help by preventing the stick from migrating further into your dog and causing more internal damage. If the stick has penetrated their chest, you should try, if at all possible, to keep your dog lying upright, on the bottom part of his chest and his belly, rather than on his side, during the drive to the vet. This will help by allowing the unaffected side of the lungs to work as efficiently as possible to compensate for the damage that is likely to have occurred to the lungs on the side of the stick penetration. Translation… it’ll help him breathe better. Here are a few of our favorite stick alternatives. They're all far safer, easy to clean, and dogs love them! 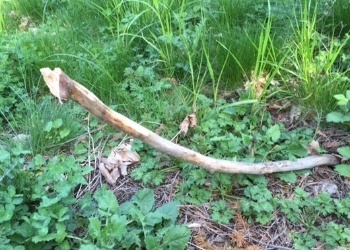 Many dogs have been injured while playing with sticks, some even fatally. Please note: Unless otherwise stated, products, services, and/or companies mentioned, or links to same, are for illustration purposes only and their inclusion does not constitute an endorsement from Preventive Vet. Additionally, we are NOT compensated if you choose to buy what we feature.